Time for another update from the labor market. The Bureau of Labor Statistics has published its state-level employment numbers for February. These are preliminary numbers for now, but usually there is not much adjustment to them once they become definitive. 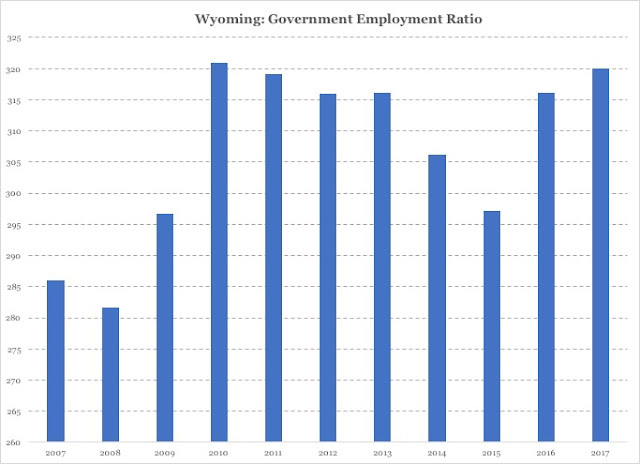 The accelerated job loss in coal mining is a matter of concern, of course, but even with that in mind I maintain my forecast: our state will soon be in a "new normal" with permanently lower private-sector employment and overall lower economic activity. We will see the end of the downslope during the second half of this year. The Government Employment Ratio is calculated by dividing private employment with the sum of state and local government employment, and multiply the ratio by 1,000.
b) with a rising Government Employment Ratio, we still have a major problem with an excessively costly government here in Wyoming.